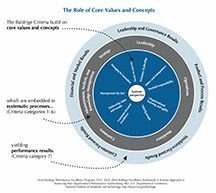 Credit: From Baldrige Performance Excellence Program. 2015. 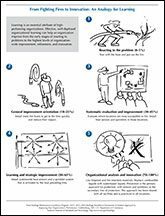 2015–2016 Baldrige Excellence Framework: A Systems Approach to Improving Your Organization's Performance. Gaithersburg, MD: U.S. Department of Commerce, National Institute of Standards and Technology. https://www.nist.gov/baldrige. 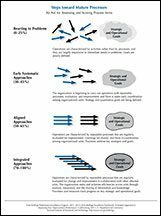 Credit: From Baldrige Performance Excellence Program. 2015. 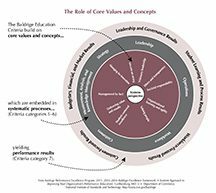 2015–2016 Baldrige Excellence Framework: A Systems Approach to Improving Your Organization's Performance (Education). Gaithersburg, MD: U.S. Department of Commerce, National Institute of Standards and Technology. https://www.nist.gov/baldrige. Credit: From Baldrige Performance Excellence Program. 2015. 2015–2016 Baldrige Excellence Framework: A Systems Approach to Improving Your Organization's Performance (Health Care). Gaithersburg, MD: U.S. Department of Commerce, National Institute of Standards and Technology. 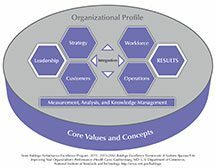 https://www.nist.gov/baldrige.